Neem or Azadirachta indica is a plant with full of medicinal value. Every element of the plant, be it leaves, twigs or barks, has properties good for the body. People have been using neem twigs as toothbrush for ages to clean their teeth and maintain oral hygiene. Neem is a proven natural antimicrobial remedy for a variety of oral health problems including bad breath, discolored teeth etc. Studies have also found how neem powder is effective against fighting bacteria responsible for causing cavities, gum disease and inflammation. You can benefit from this magical plant and stay on the right side of your dental health. 1. Fight bad breath – Did you know what people in old times use to fight bad breath? When toothpaste was not invented, what tool as mostly used for removing the bad stench from the mouth? In Indian culture and some other Asian countries, people chew neem leaves to remove bad breath and skill the bacteria. The leaves are still used in fighting off plaque and tartar which is responsible for most oral problems in gums and teeth. You can also chew raw neem leaves, remove all the plaque and keep your teeth whiter and brighter easily. 2. Whiten teeth – In interiors and villages across India, people still chew neem bark to whiten their teeth. This also help in fighting dental disease. The anti-bacteria and anti-microbial properties of neem can be leveraged effectively by chewing its bark to whiten and brighten the teeth in natural manner. In fact, neem bark is also effective against cavities and dental disorders caused by bacteria. So, trust this natural and herbal way of keeping your teeth and gums healthy forever. 3. Remove bacteria from between teeth – Your teeth can never be healthy and bright unless there are bacteria. If you want to remove the bacteria in a natural way, neem is easily the best available remedy for that. The method is simple where you can boil neem leaves in water and use the solution for gargling. You can use the solution after staining the water and the gargle will help remove all the bacteria from the mouth. This method is also helpful in keeping the teeth clean and white forever. 4. Get sparkling white teeth – The best thing about neem is, you can use it in different parts to get the desired results for your teeth. If you want sparkling white teeth, use neem tea bags and then brew it in hot water. You can now use the solution to gargle the mouth, swish it around and swallow. This type of cleaning can ensure healthy teeth and gums for a long time. Plus, neem is easily available, and you can trust its natural goodness to maintain oral health. 5. Use herbal-based toothpaste with neem ingredient – It’s easy to find herbal-based toothpaste having neem as popular and major ingredients. You can trust this type of paste to brush your teeth and remove bacteria, prevent plaque build up and maintain a better oral health. Such toothpastes don’t have the colour, flavour and additives that their other commercial counterparts do, which is the reason behind their effectiveness in true sense. You can include them in your daily oral care routine and keep your teeth clean and healthy. They don’t have any side effects and you can rely them without any worries at all. 6. Use Neem Twigs for white and healthy teeth– A lot of people still use neem twigs to clean their mouth each morning. 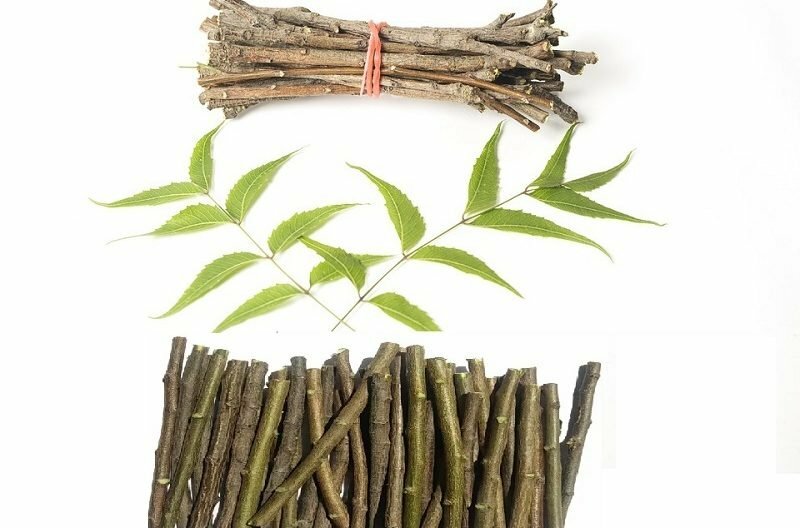 The use of neem twig as toothbrush is probably as old as the humanity as you can this understand how beneficial it could be. In fact, chewing on neem twigs not only whiten the teeth but also prevent gum diseases. You can use it for a few days and see how your teeth turn shades whiter and brighter without much of effort. The twig can also be used to clean the tongue and remove all the bacteria that reside on the surface. If you have any doubt regarding the use of neem products for your teeth and gums, you can consult a top dentist Greenpoint and clear the doubts easily.